Antietam rendered in a vivid, modern way, covering the fighting in full during America's deadliest day, but also weaving Lincoln more deeply into the tale than in a standard military history. Please visit the author’s Facebook page for pictures and updates. 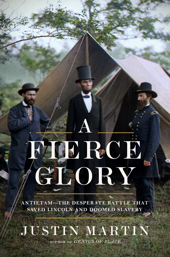 Justin Martin’s latest is A Fierce Glory: Antietam—The Desperate Battle That Saved Lincoln and Doomed Slavery (September 2018, Da Capo Press). This is a character-rich, modern-style account of an 1862 Civil War battle that was more important than Gettysburg and—with a death toll of 3,650 soldiers—remains the bloodiest single day in U.S. history. Lincoln is woven deeply into this tale, far more than in a standard military history of the battle. The rich cast also includes: generals George McClellan and Robert E. Lee, medical pioneers Clara Barton and Jonathan Letterman, and Alexander Gardner, the groundbreaking photographer. Martin’s specialty is American history, meticulously researched, but delivered in a narrative style that’s akin to fiction. His previous book is Rebel Souls: Walt Whitman and America’s First Bohemians (Da Capo, 2014), the first book ever written about a decadent and incredibly influential artists’ circle that hung out at Pfaff’s saloon in NYC during the 1850s. Among its members: a young Walt Whitman; Artemus Ward, America’s first standup comic; psychedelic drug pioneer Fitz Hugh Ludlow; and Adah Isaacs Menken, an actress notorious for her “Naked Lady” act. Earlier efforts include Genius of Place: The Life of Frederick Law Olmsted (Da Capo, 2011). Genius tells the story of one of the most important figures in the history of America. Olmsted was a fervent abolitionist, noted journalist, Civil War hero, early environmentalist, and the landscape architect behind New York’s Central Park, Boston’s Emerald Necklace, Stanford University, the Biltmore Estate and dozens of other green spaces around the U.S. Martin’s other books are Greenspan: The Man Behind Money (Perseus Publishing, 2000) and Nader: Crusader, Spoiler, Icon (Perseus, 2002). All of Martin’s books have been reviewed widely and well, drawing raves in publications including the Washington Post, Miami Herald, San Francisco Chronicle, Christian Science Monitor, and Vanity Fair. Martin’s bestselling Greenspan bio was chosen as a notable book by the New York Times Book Review. Rebel Souls was selected as the outstanding biography of 2014 by the Victoria Society, New York, was a finalist for the Marfield Prize, and was picked as one of the best books of 2014 by both the Kansas City Star and Choice magazine. Martin is a former staff writer at Fortune. 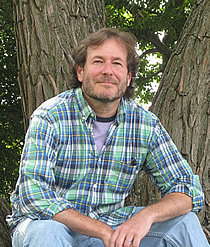 His articles have appeared in various magazines such as Newsweek, Money, and Conde Nast Traveler, as well as in newspapers across the country: The New York Times, Boston Globe, San Francisco Chronicle, and Lawrence (KS) Journal World. To discuss his various books and articles, Martin has made numerous television appearances on CNN, CBS Sunday Morning, CNBC Power Lunch, and is also a radio regular. Martin is a 1987 graduate of Rice University in Houston, Texas. He lives with his wife and twin sons in Forest Hills Gardens, a landmark NYC neighborhood designed by Frederick Law Olmsted Jr.